Ziploc bags, Hot Wheels, beanbag chairs and Big Macs: They all have one thing in common. They all turned 50 this year. And to commemorate its milestone birthday, McDonald's is doing something a bit unconventional. They’ve introduced the first fully food-backed global currency, the collectible MacCoin. Not to be confused in any way shape or form with the Bitcoin (a cryptocurrency, or a form of electronic cash), the MacCoin is a limited-edition global currency that Big Mac fans can share, collect or redeem. To be clear, this commemorative coin has zero cash value, and to get your hands on one, merely buy a Big Mac on Thursday, and you’ll receive a MacCoin. What can you use it for? To get another — free — Big Mac. "We wanted a global celebration as unique as the burger itself," said McDonald’s President and CEO Steve Easterbrook in a press release. 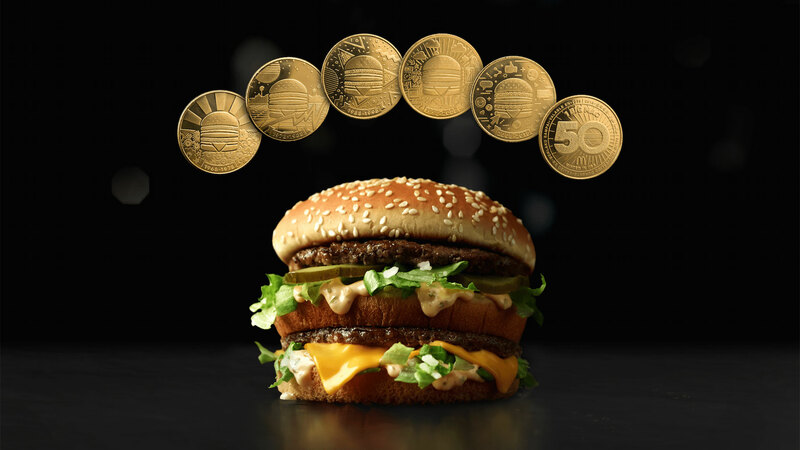 "The MacCoin transcends currencies to commemorate our global iconic burger while giving customers all over the world a chance to enjoy a Big Mac on us." The '90s: "bold, abstract shapes"
The early '00s: "technology at the forefront of the turn of the century"
The '10s: "the evolution of communication"
If you think I’d redeem a MacCoin for another Big Mac rather than hoarding a vault of them like a treasure for decades, you are incorrect. "When my great-grandfather Jim Delligatti invented the Big Mac at his grill in Uniontown, Pennsylvania, he just wanted to make his local customers happy," said Nick Delligatti, fourth-generation McDonald’s owner-operator and great-grandson of Jim Delligatti, the inventor of the Big Mac. "Aug. 2 would have been his 100th birthday, and I believe he would be very proud knowing his humble sandwich has made such a lasting impression that people all around the world can enjoy it wherever they find a McDonald’s." How did this come about, you ask? Apparently, it was inspired by the Big Mac Index, an annual report created in 1986 by The Economist as a way to measure the purchasing power of international currency. "They use it to this day," Easterbrook told USA Today. "Why not have some fun with it? Create our own currency." McDonald’s has no plans to revamp or change anything about the Big Mac. And why would they? It’s the fast-food chain’s top-selling sandwich. According to Business Insider, McDonald’s sold 1.3 billion Big Macs globally in 2017. "We think the Big Mac needs to be sacrosanct," Easterbrook told them.